Join Dan and Tanya in Namibia and Botswana by AIR! 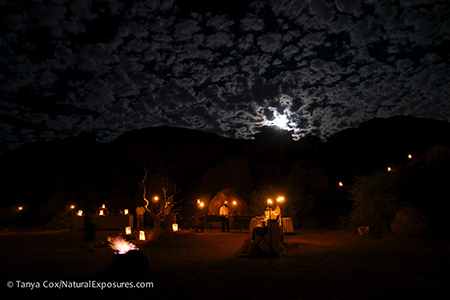 Experience the unspoiled iconic landscapes of Namibia, one of the world’s most spectacular desert ecosystems. Sleep in comfort along the rim of Fish River Canyon, the second largest canyon on Earth! 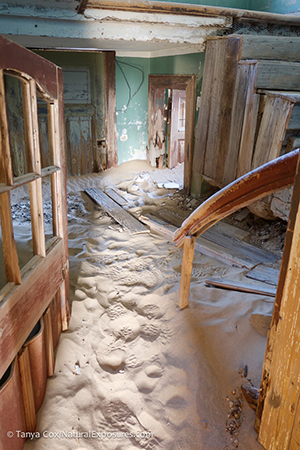 Photograph the deserted ghost town of Kolmanskop. Fly over this enchanting land where colossal sand dunes and red rock canyons create striking shapes and colors under an endless African sky. And YES, there are pink flamingos in Namibia! 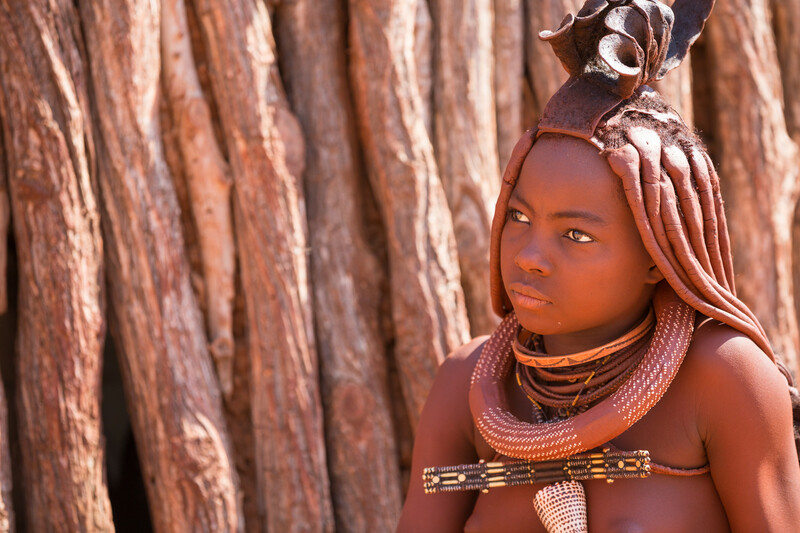 Photograph the strikingly beautiful Himba people. A final stop in Botswana at a luxurious lodge grants us exclusive access to photo hides—photograph animals and birds at eye level, or enjoy a land safari. See more by air with Natural Exposures! This landscape, culture, and wildlife photographic adventure will take you up in the air above the beautiful sand dunes of Namibia. Complimentary aerials over the dunes by helicopter, fixed wing, or hot air balloon. Our safari time in Botswana will be on land. For ease and luxury, we’ll have chartered planes to take us from location to location throughout Namibia and South Africa to Botswana. Depart US/Canada and fly to Johannesburg (JNB), South Africa. This morning we’ll take a domestic commercial flight from Johannesburg to Windhoek and then board a charter plane to our first destination, Fish River Canyon. Located in the northern part of the Nama Karoo, a vast, open region dominated by low-shrub vegetation, Fish River Canyon is the second largest canyon on Earth! Fascinating flora and fauna have adapted to the harsh environment of this rocky, rugged 500,000 million-year-old landscape. We’re sure to see lonely quiver trees, one of the rarest plants in the world, found only on the continent of Africa. Wildlife such as oryx, mountain zebra, giraffe, springbok, kudu, leopard, steenbok, baboon, wild horse, and ostrich are often seen throughout the canyon area. A sunrise shoot of Fish River Canyon followed by a hearty breakfast. Mid-morning, we’ll board our charter flight and head to Luderitz. Luderitz is in the Succulent Karoo region—different from all other deserts in the world—not prone to prolonged drought since rainfall is reliable and predictable. The Succulent Karoo boasts the richest succulent flora on Earth, harboring about one-third of the world’s 10,000 species. Forty percent of the plant species here are endemic, found nowhere else in the world! A region of unparalleled botanical biodiversity, it is the only plant hot spot that is entirely arid. We’ll have dinner and overnight at the Luderitz Nest Hotel. Today we’ll start our day early to visit the fascinating ghost town of Kolmanskop located in the unwelcoming land of the Namib Desert. Breakfast at leisure in this ghost town at the local cafe. In the 1900s, Kolmanskop boasted one of the richest diamond deposits on Earth. The German government declared it part of the “Sperrgebiet,” or forbidden diamond territory. This thriving and bustling town provided much needed shelter for diamond workers; opulent homes and shops protected them from an extremely harsh environment with no hint of moisture. Fresh water was hauled in by train and pumped into their storage tanks. Though isolated, the town’s residents afforded every possible luxury. However, by the early 1930s, the diamond deposits began to deplete and the area experienced decline. To add to the town’s demise, most inhabitants departed when the world’s richest diamond-bearing deposits ever were discovered south of Kolmanskop in 1928. In 1956, the few who remained left the town completely deserted. Today, rolling drifts of knee-deep sand shape gentle curves in the abandoned houses and buildings that remain. Though a haunting monument of the day’s boom and bust, this desert ghost town provides an engrossing history along with incredible photo opportunities. Follow the shafts of light throughout the old buildings in search of imperfect, but beautiful, walls, doors, and angles for unique images. We’ll also search for an iconic symbol of this area, the wild horse herd of Namibia. These Namib Desert “ghost” horses have miraculously learned to adapt to the extreme heat with minimal water sources, their origins shrouded in a cloud of mystery. Get ready for an early AM sunrise shoot tomorrow at Deadvlei! We’ll stay at the only lodge in Namib-Naukluft National Park, giving us access to the many natural wonders of this park during beautiful morning light before the main gate opens. 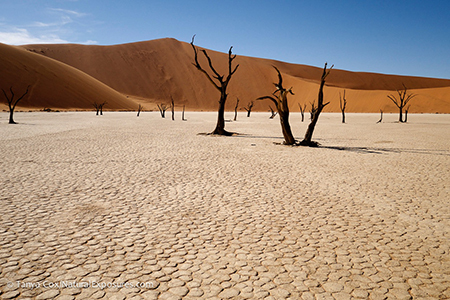 Deadvlei, translated to “dead marsh,'” is another white clay pan known for its ancient camel thorn (acacia) tress, now only dark skeletons against the white pan floor and bright red-orange dunes. The trees thrived hundreds of years ago when the Tsauchab River flooded, but the climate eventually changed and the sand dunes encroached, blocking the river from reaching the area. The trees remain intact—the wood does not decompose because of the dry climate—so they sit, blackened from the scorch of the sun. We’ll access the dunes early this morning, and then transfer to Sossusvlei Lodge where we’ll spend the next two nights. This beautiful lodge has air-conditioned rooms, pool, bar, wonderful food, and easy access to our complimentary aerial flights. Fly over the dunes mornings and evenings by helicopter, fixed wing, or balloon. Our private bus will tour the park daily for those who do not wish do aerials. Please note aerial flights are based on weather and availability (two complimentary flights per guest). Sossusvlei, a clay/salt pan, is home to the highest sand dunes on the planet! Crests of vivid pink, orange, and the oldest dunes an intense red, create striking landscapes with the contrasting white vleis (clay pans) and vast blue sky. Dwarfed by the sheer size of the dunes, you may find this one of the most mind-blowing sights you will ever see! The Tsauchab River carved the Sesriem Canyon over millions of years. This is one of the few places in the area that holds water all year round. The canyon was an important source of water for early settlers in the area. There will be free time midday, when the sun is hot and too harsh for photography. Take a nap, enjoy a dip in the sparkling pool, or have yourself an ice-cold beer under the shady trees in the Acacia beer garden. Today we will have an opportunity to meet and photograph the indigenous Himba people in Swankopmund. These semi-nomadic herders are striking, an iconic image of Africa. Midday we will return to Windhoek. A casual BBQ dinner and beer at the famous Joe’s Beerhouse. Most likely we’ll be ready for a small break at this point, so we’ll spend two nights for some R&R at The Olive Exclusive All Suite Hotel. Experience luxury in Namibia’s capital city. Each suite in the hotel reflects a different region in Namibia and has its own lounge area with fireplace and wide glass doors which open onto a spacious deck where you can relax on a shady daybed. Indulge in a bubble bath with sweeping mountain views. Mashatu Game Reserve comprises 72,000 acres of privately owned land in the Northern Tuli Game Reserve of Botswana. Mashatu and its neighbors—the Tuli Safari Area of Zimbabwe and Mapungubwe National Park in South Africa—form a vast cross boundary conservation area to protect all living things in the region. Though on the eastern fringes of the Kalahari Desert, the reserve is at the converge of the great Limpopo and Sashe Rivers, making it an ideal place for wildlife to take shelter from the sun in nutrient-rich vegetation. Mashatu has a diverse landscape. Wide-open plains, grassland, riverine forests, rocky hills, marshland, and majestic sandstone ridges make it a haven to experience a variety of Africa’s magnificent wildlife. Flora and fauna flourish in Mashatu. Over 50 mammal and reptile species, 350 bird species (including the lilac-breasted roller), and 150 tree species can be found in the area! Mashatu boasts home to the largest herds of elephants on privately owned land in all of Africa, and two more of the Big Five—namely leopard and lion—are frequently encountered here. Giraffe, eland, ostrich, and the kori bustard, each a world record holder in the animal kingdom, all reside within the reserve’s accommodating landscape. Other notable species include cheetah, aardwolf, bat-eared fox, African wildcat, honey badger, spotted hyena, and the black-backed jackal. Enjoy this video! We will venture out twice daily to experience all Mashatu has to offer. Guests will rotate between exclusive photographic hides and land safaris. Mashatu’s exclusive photographic hides provide you the opportunity to sit and photograph the animals coming directly at you, an experience not to be forgotten! The hides are specially positioned with great consideration for maximizing photographic potential, making it possible to capture unique angles and exceptional images. 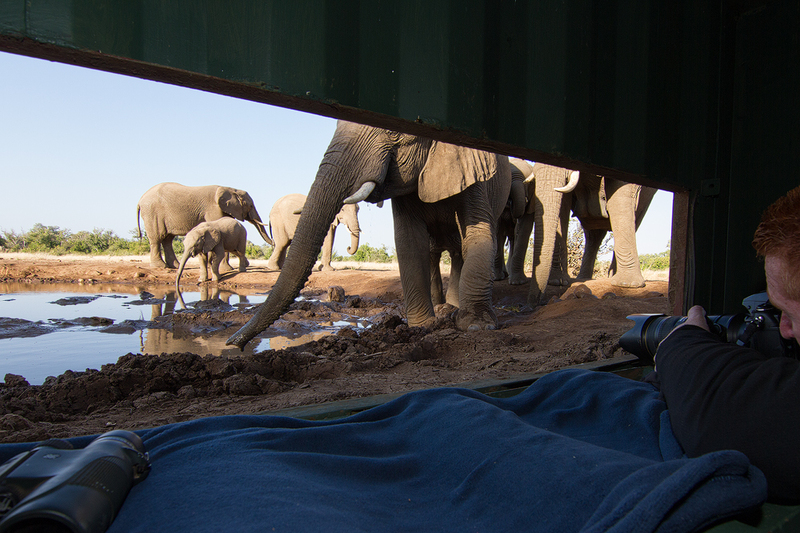 We will spend our four final days and nights at the luxurious Mashatu Lodge Main Camp. Guests will stay in supremely comfortable, spacious suites with air-conditioning and en suite bathroom. A world-class dining experience can be expected at Mashatu. Home-cooked, flavorful traditional African fare mixed with Western dishes will be served daily. Any appetite will be satisfied with the camp’s variety of fresh fruits, vegetables, homemade breads and pies, succulent meat dishes, and delicious desserts. Morning shoot in hide or by land safari. After lunch, we’ll board a domestic flight and head back to Johannesburg to connect with our evening flights home. Activities noted including photographic aerial flights at Sossusvlei, Desert Tour, etc. Arrive any time of day in Johannesburg (JNB), South Africa. Depart Johannesburg (JNB), South Africa on an evening flight. This Johannesburg airport hotel provides convenience, style, and all of the upscale facilities you’d expect from an award-winning hotel, including a spa, business center, and Quills African restaurant. 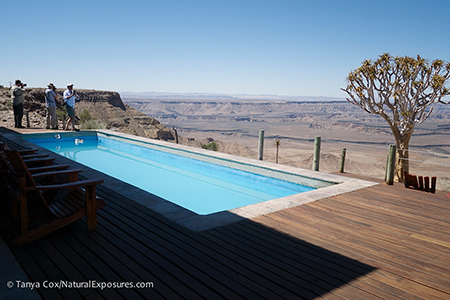 The architecture and interiors of Fish River Lodge have taken their queue from the rugged landscape that surround it. Contemporary, and at times monastic, the lodge was designed to reflect the unique beauty of its location. The award-winning Lüderitz Nest Hotel is one of Namibia’s leading resort hotels and is located directly on Lüderitz Bay with its own private tidal beach with walk-on jetty – unique in Namibia! All spacious en suite rooms have direct sea views. Hotel features include swimming pools, sauna, the Crayfish Bar & Lounge, and free Wi-Fi in rooms. Built in an environmentally sensitive manner primarily from wood, canvas, and thatch, in an attractive ‘afro-village’ style, Sossus Dune Lodge offers guests an evocative and life changing experience. All spacious chalets have panoramic views of either the dunes or Sesriem Canyon and surrounding mountains. Situated within the Namib-Naukluft National Park, guests benefit from being able to reach Sossusvlei before sunrise and staying until after sunset. 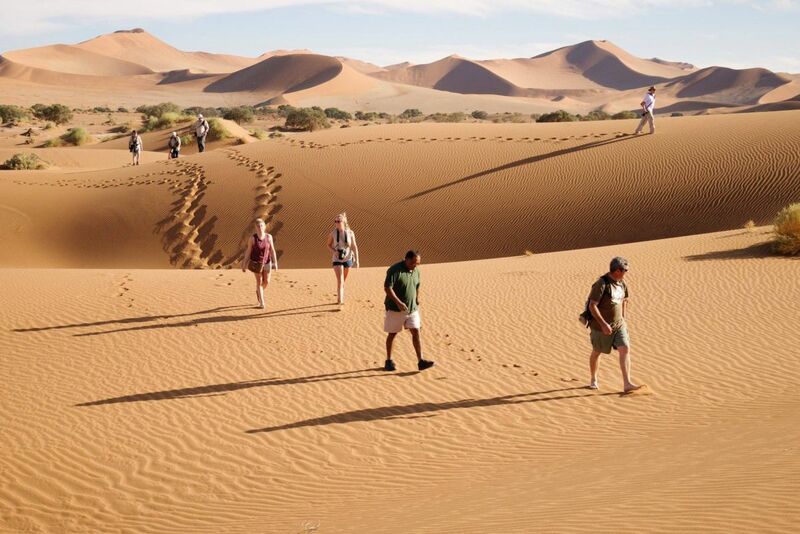 Situated at the Entrance Gate to the Namib-Naukluft National Park, Sossusvlei Lodge offers direct access to the towering red sand dunes, the famous pan of Sossusvlei, the scorched black trees of Dead Vlei and the remarkable depths of the Sesriem Canyon. Facilities include a sparkling pool, bar, sundowner deck, beer garden, and an al fresco terrace where one can enjoy exquisite food, award-winning wines, and magnificent views of the floodlit waterhole. Uniquely located on the iconic and historic Swakopmund Mole and surrounded on three sides by the Southern Atlantic Ocean, rooms and suites will offer the finest uninterrupted sea views available anywhere in this quaint historic town. Its architectural inspiration finds its roots deep in Namibian German history and reflects this in a tasteful contemporary manner. The interiors are residential in nature, and the brief to all designers involved was to create a non-hotel, hotel. Strand Hotel Swakopmund promises guests a warm Namibian welcome and a stay, during which they will be hosted in a relaxed, uncomplicated manner. Rooms feature tea and coffee stations, mini bars, hair dryers, free Wi-Fi, telephones, and air conditioning. The Olive Exclusive – the first ultra-luxurious sanctuary of its kind in the Namibian capital – is cool, contemporary, and stylish but with a warm heart and authentic African soul. Its sleek, modern lines are complemented by organic textures, natural furnishings, an eco-friendly approach and dedicated personal service. Simple elegance is key, from the organic rough-hewn wooden benches and side tables, through the sculpted chunk of granite that serves as a coffee table in the guest lounge, to walls clad in abstract Namibian landscapes by well-known South African designer and photographer Micky Hoyle. The seven suites are individually decorated. Each reflects a different region in Namibia, and each has its own lounge area with fireplace and dining room for private dining. Wide glass doors open onto spacious decks where you can relax on a shady daybed, enjoy al fresco lunches, or if yours is a premium suite, take a dip in your own private plunge pool. Such are the creature comforts that you may find hard to leave: sink into an extra-length bed dressed in crisp, pure cotton linen, or indulge in a bubble bath in a free standing tub with sweeping mountain views. Air-conditioning, high definition satellite TV, and iPod docking stations are standard, as is a computer with Wi-Fi access. Then there’s a fully stocked mini bar, complete with a premium wine selection, so you can toast the setting sun in fine style. Fourteen luxury suites lie along the camp’s perimeter and are designed to allow absolute privacy and a communion with the bush and its inhabitants. Watch elephants splashing at the waterhole, listen to the lyrical melody of the woodlands kingfisher on a branch overhead, smell the grassy scent of the bushveld, touch the bark of an ancient tree, and inhale a breath of air so pure, it’s intoxicating. Each of the air-conditioned suites at Mashatu Lodge Main Camp is tastefully decorated and includes impressive black and white prints of Africa’s most beautiful animals. A double bed and an extra-large single bed, together with a seating area that includes a single day bed, comfortably accommodates guests. The ample en-suite bathroom with both bath and shower facilities and a separate W.C. complete the well-appointed suites. A large swimming pool is a focal point where Mashatu Lodge visitors can cool down and relax between game activities. The Discovery Room is the portal through which curious visitors get a glimpse of another world – one that existed long before the appearance of man. We will be visiting three countries during this trip, so be sure that your passport is valid for the time required by each country and also that you have enough blank pages in your passport for entry into each country. We are not responsible if you do not meet the entry requirements for the trip! A passport with at least six months validity is required for both Namibia and Botswana. Passports must be valid for at least 30 days after your date of departure from South Africa. Make sure you have plenty of pages in your passport! For US citizens, plane side visas for Namibia are available for tourists staying less than 90 days. Botswana does not require a visa for stays less than 90 days. A visitor visa will be issued at the port of entry in South Africa for those staying 90 days or less. It is advisable to carry your passport containing any valid visas and also your driver’s license while traveling in Namibia to avoid any issues with the national authorities. For the latest updates on entry requirements for US citizens, please visit the US Bureau of Consular Affairs website for each country. South Africa, Namibia, and Botswana all require proof of yellow fever vaccination if you’re traveling from/transiting through a country where yellow fever is endemic/WHO designated yellow fever countries. For South Africa specifically, you should obtain the shot at least ten days before arrival. English is the official language of Namibia. People commonly speak two or three languages, and almost half speak Oshiwambo. Afrikaans is still widely spoken and functions as the lingua franca, or the language adopted as a common language between speakers whose native languages are different. The official language of Botswana is English, spoken by around 90% of the population.